college offering accredited post-graduate courses and degrees. Students must be registered in a full-time Ph.D./doctoral program and completed at least one year of that program or have received a master’s degree in an aerospace-related field at the time the application is submitted. Applicants must not graduate from their Ph.D. or doctoral program before April 2019. Please note that post-doctoral research programs are not eligible for the Fellowship. Members and employees of Zonta International or the Zonta International Foundation are also not eligible to apply for the Fellowship. Be registered in a full-time Ph.D./doctoral program in a qualifying area of science or engineering closely related to advanced studies in aerospace-related science or aerospace-related engineering and completed at least one year of that program or have received a master’s degree in an aerospace-related field at the time the application is submitted. A verification of current enrollment must be submitted with the application. Acceptance letters are not verification of enrollment and will not be accepted. Demonstrate a superior academic record at a recognized university or college with accredited courses in aerospace-related studies as verified by official transcripts and recommendations. In programs where graduate transcripts are not provided as a matter of institutional policy, please provide a statement of that policy from the registrar or other school official. Please note that links from universities containing electronic transcripts will not be accepted. Provide evidence of a well-defined research program in aerospace-related science or aerospace-related engineering as described in the application essay (in general scientific terms), the academic documents (references, transcripts, verification of enrollment) and the list of publications (Note: please do not attach publications; citing the references is sufficient). Clearly demonstrate the relationship of the research to aerospace and furnish verification of research program through at least one of the reference letters required with the application. The thesis supervisor or advisor and a university professor must each be one of the referees. Applicant must be registered in a full-time Ph.D./doctoral program by 15 November 2018 and must not graduate before April 2019. The Fellowship may be used for tuition, books and fees, or living expenses (room, board or travel). 1. The payment of US$10,000 is planned for September-October subject to any US sanctions regulation. 2. For domestic and foreign recipients studying in the United States, Fellowship funds used for tuition, books, fees, supplies or required equipment for the program of study are not considered taxable income. Withholding taxes may be required on funds used for living expenses or other non-qualified expenses, e.g. room, board or travel to conferences. 3. Recipients are not permitted to defer the Fellowship. 4. Fellows may accept additional grants and scholarships from other sources. Biographical information (as requested on page 4 of the application). List and include official detailed transcripts of grades from all universities/colleges attended, including undergraduate institutions and degrees received (links from universities containing electronic transcripts will not be accepted). List and include translated transcripts in English of all grades from all universities/colleges/institutions attended. List scholarships, fellowships and honors received, if any. List previous publications, if any (please do not attach publications). Essay on academic program and professional goals-applicant should describe, in general scientific terms, a well-defined research program for her Ph.D./doctoral studies. Three recommendations from professors (or supervisors); one of the recommendations must be from a thesis supervisor or advisor and one from a university professor. Use the provided recommendation waiver form if professor or supervisor is submitting recommendation via email. Verification of Current Enrollment form from the university/college registrar. All non-English documents must be translated into English to be considered. Information other than official transcripts and recommendations must be limited to the space provided;attachments, articles, pamphlets, books, curriculum vitae or other publications are not requested and will not be considered. Applications are accepted by email or regular mail; however, email submissions are preferred. Applications submitted by email to programs@zonta.org must be signed and sent as a PDF. Recommendations submitted by regular mail must be confidential and enclosed in a sealed envelope signed by the referee. If the recommendations are being submitted via email by referees, a recommendation waiver form must accompany each recommendation. All recommendation letters must be signed by the referees. The official detailed transcripts and verification of enrollment can also be submitted by email as long as they are signed and sent as a PDF in color. If not able to scan in color, please submit the official detailed transcripts and verification of enrollment via regular mail. 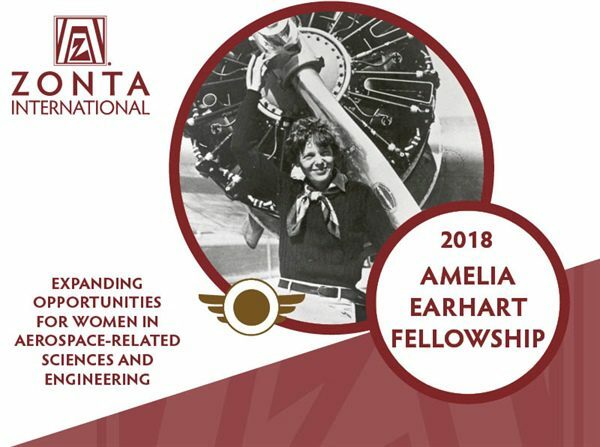 The application and material listed above for 2018 Amelia Earhart Fellowships must be received or post-marked by 15 November 2017 to be considered. Applications that are incomplete or late due to postal delays will not be considered. Please do not submit multiple copies. Previous articleInternational Civil Aviation Organization (ICAO) Young Aviation Professionals Programme 2018 -Montréal,Canada ( CAD $4 000/Month).